Training plan is the outline of the training objectives, training curriculum, strategies and competencies that the trainee will undertake. A development tool that can help all trainers to have the document that will guide them on how they hasten the skills and talents of the trainees, also to have the standards if they already met the competencies they must obtained as based on the Training Plans. 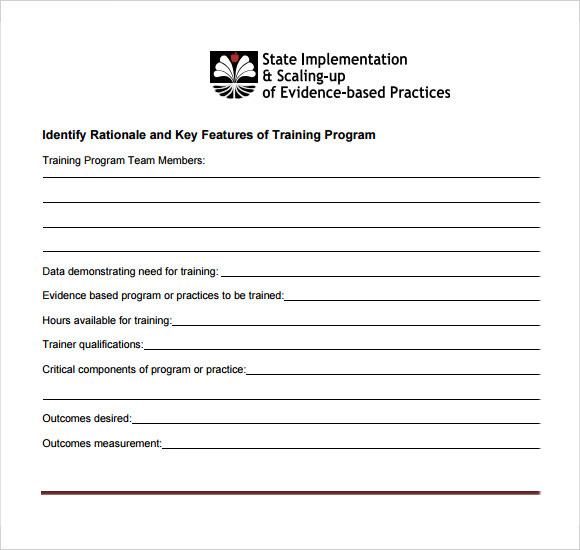 An Training template can be an example for you to have the sample format you can use in making the teaching strategies and methods for the learning program. The training plan you will use must be based on the nature of the subject or profession which can be modified to be able to meet the needed skills and information of the trainees. 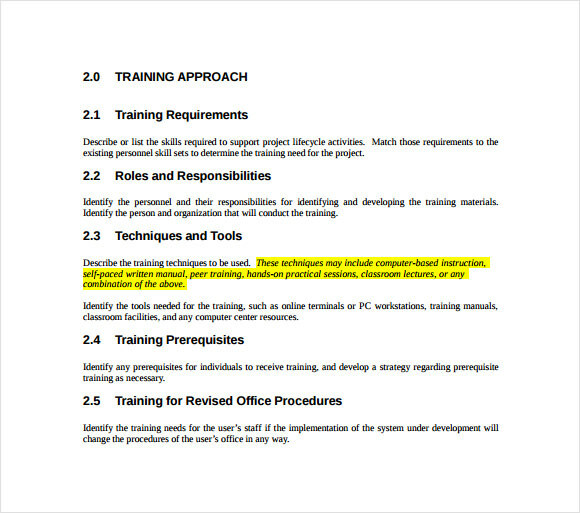 In the first portion of the PDF options are present where you can enlist the participants of the training programs. After that, there are some options where particular data along with evidence is present for demonstrating the training. Trainer’s qualifications and hours are other two important parts that are further included in this training schedule. Training name along with persons who are responsible for training are included in the first part. This is designed in beautiful table formats where training objectives along with key messages and training flow are enlisted here. In addition to that, time, section, description section are present where the user needs to fill it up the details. 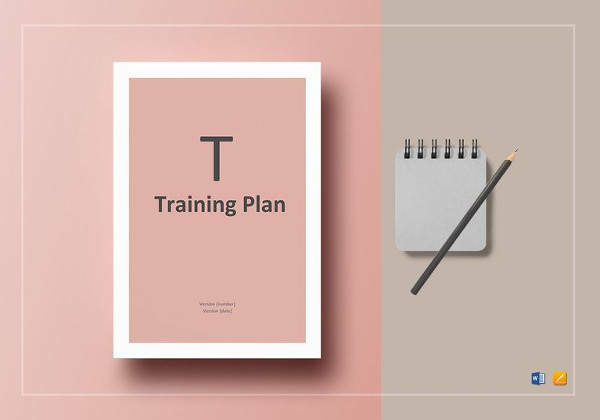 This is very artistically designed training plan template designed not only for internal use; this is also used as a part of the presentation. This is designed with four main points including why the plan is designed, what are the steps has been followed for developing this and the guide lines are designed for this plan as well. 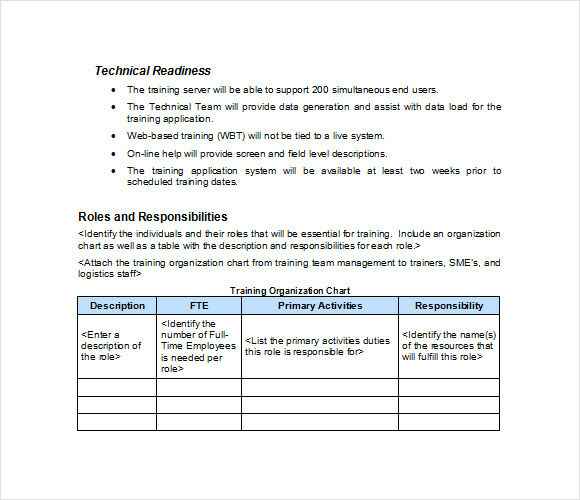 In the first part of the template, there is a section which is called as technical readiness’s where point wise some important information about the training program is listed. Roles and responsibilities are some other sections where these are listed as well. 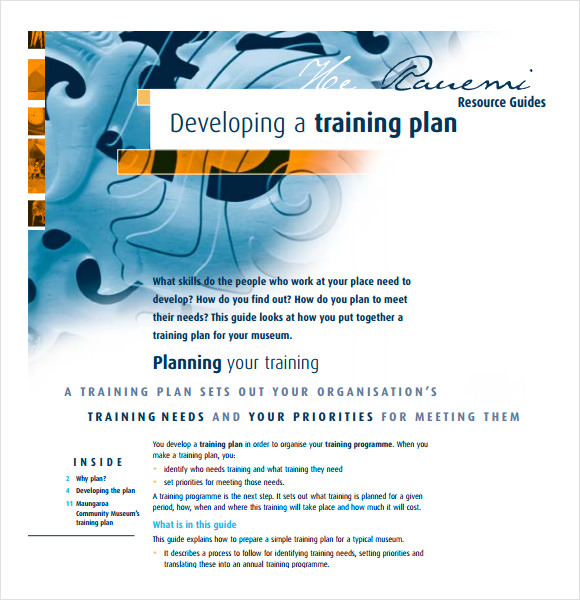 In the last section there is a sample table format available where a description of the training along with FTE, primary activities and responsibilities are included. 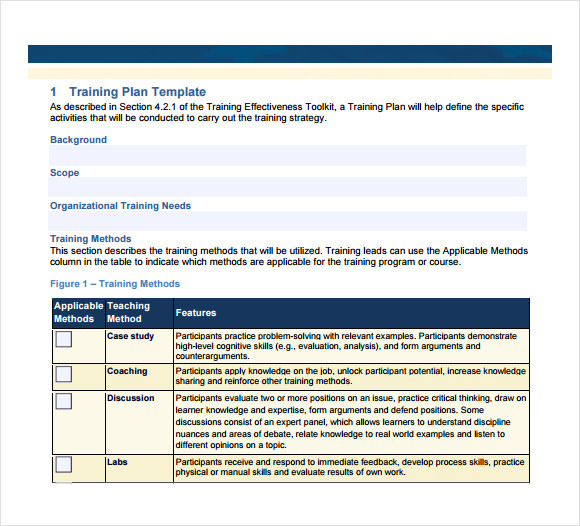 What Are The Reasons To Use Training Plan Templates? 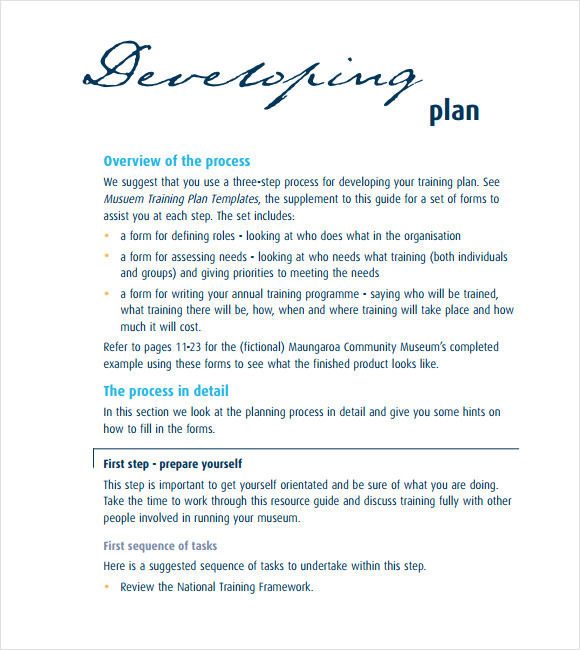 This is basically a development tool, widely used for planning various plans like training objectives, training curriculum, and strategies and competencies that the trainee will undertake. This helps the trainers to guide them by putting some extra effort on how they hasten the skills and talents of the trainees. This also ensures that if the trainee people already met the competencies they must obtain as based on the training plan. It also helps the organizations for developing and planning the program in a most structured basis. You may like Coaching Plan Templates. When To Use Training Plan Templates? 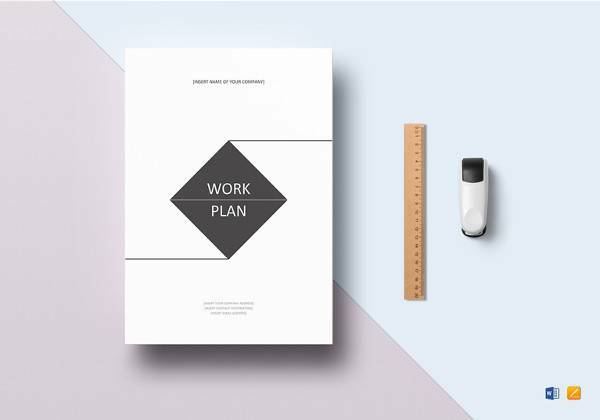 These types of templates are widely used in several schools, colleges and other management institutions where in regular interval training is conducted. 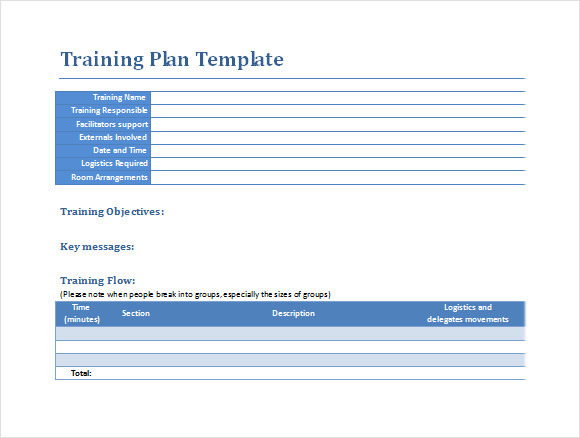 The templates also ensure that the complete training schedule with full details like training name, trainer details are listed here. Moreover all the details of the students who are attending the training are listed. All over this is a documentation of the whole training program. It also helps in developing and designing various types of training related strategies as well. You may also like Performance Plans. There are no particular tips present for developing this type of training template. 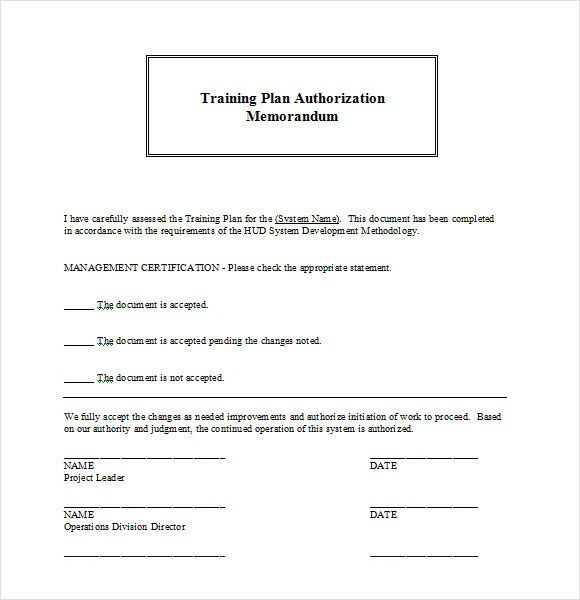 These templates ensure training related all the information is enlisted in the designs. So that, for any type of future use or references as well, this can be used and referred. 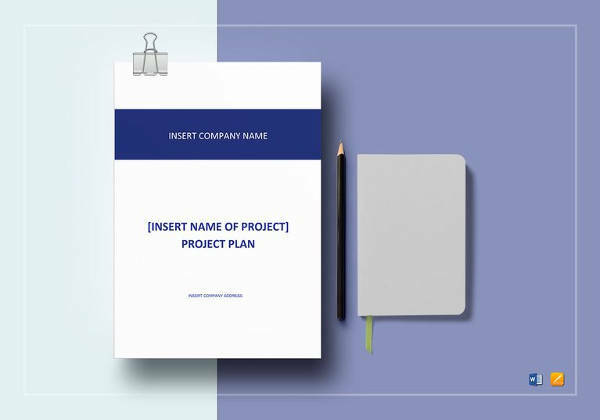 The main objective of designing this type of template is that, training objectives, training curriculum, strategies and competencies are listed here. So that, all the necessary details with proper information can be picked and shared with the higher authorities or to the superior when needed. A particular institute can customize and convert the file format of a training template to add more details and even attach their own logo to make it look more professional. Nowadays, all the details are filled up and one is shared with the trainee and other is kept in the institute.